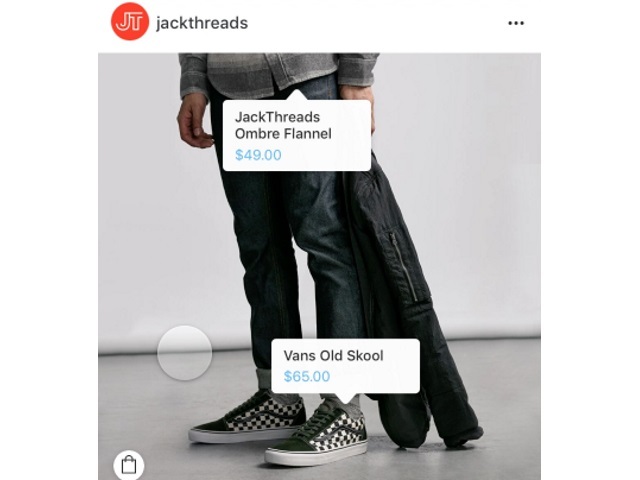 Instagram revealed a new feature earlier this month that many retail brands would love to jump into: taggable products, a new shopping experience inside the application. The taggable products feature allows users to tap the tags that are applied to photos. Apart from the usual tags, these will offer more details about the product. The even more awesome part is that this product view window will have a purchase link, which will redirect users to retailers’ own products pages, where they can complete their purchases. InstagramShoppingWarbyParker from SocialTimes on Vimeo. This means users can buy products they see on Instagram directly through the app, without having to search for those products in other windows. Instagram vice president of monetization James Quarles said 60 percent of Instagrammers say they learn about products and services on the app, while 75 percent say they take actions like visiting sites, searching or telling friends after being influenced by posts on Instagram. And according to the latest research from GlobalWebIndex, one-half of instagrammers research products on the social network. As we see, Instagram is more than a place where users like and comment on other users’ photos–it is a great place to find new customers, too. And with the new taggable products feature, brands that use the platform have the opportunity to start making some real money. But let’s delve into this topic and see if it’s something suitable for influencers and what brands should take advantage of it. Different ways in which products are showcased to users. The ability to save content and take actions later. We want to understand how to deliver the most seamless shopping experience for consumers and businesses on Instagram and, ultimately, mobile. When I first heard the news about taggable products, I began thinking about the two most important elements that can sell a product: the influencer and the brand. How will this feature be suitable for them? Who will use it? Who will get more money out of it? What will be the user experience like? This is why I will try to share my personal opinion about this feature and what you should learn before you jump into it. There are many users who try to hack Instagram to make money. The standard strategy is to upload a video or photo and write a description in which users are told to check the profile’s bio and click the link found there. There is also a simple way of tagging a brand in order to raise awareness on its Instagram profile. There is another thing we have to be careful about. How about including a small disclaimer when content is sponsored? Influencers work with brands and are getting paid to post on Instagram. Some use terms like “sponsored” or “ad” or “advertising” to let their users know the content is part of collaboration with a brand. Do they have to tell their users that a post is sponsored? Or will the users understand that only by seeing the tagged products? The Kardashians know better. Maybe Instagram thought about this situation and will take care of it. Or will it?